Replication events: .The RNA dependent RNA polymerase complex binds to the leader sequence on the encapsidated (-)RNA genome, and starts replication. The antigenome is concomitantly encapsidated during replication. The RNA dependent RNA polymerase complex ignores all transcription signals when in replication mode. 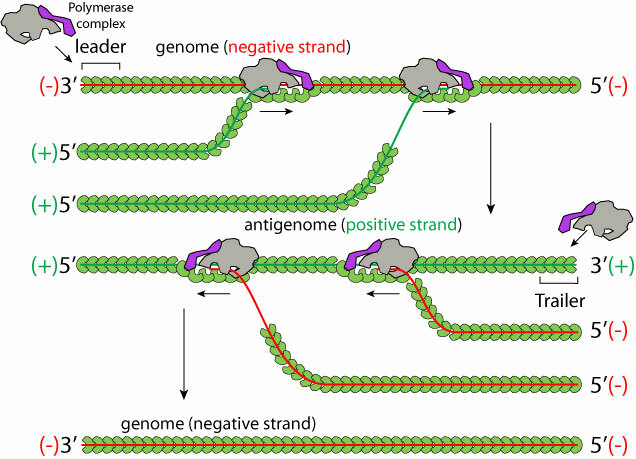 The antigenome is then replicated under the same process, the viral polymerase complex binding first tot the trailer sequence. Notes: The viral RdRP complex is presumably the same for replication and transcription. It may be a transcriptase by default and turn into the replicase mode depending on nucleocapsid concentration. The genome/antigenome ratio is about 10 for many viruses. Presumably the trailer sequence is a stronger replication promoter that the leader sequence.